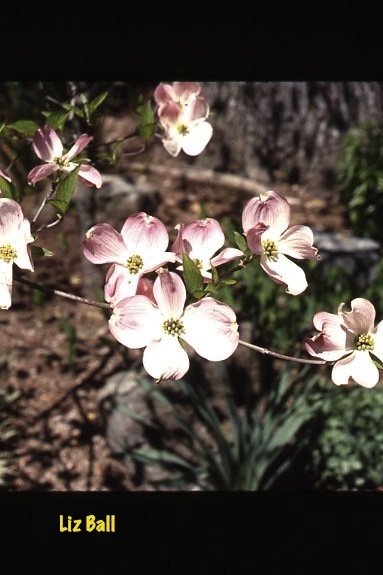 Flowering dogwood trees display their spectacular blossoms to best advantage against a background of either needled or broadleaf evergreens such as spruce, pine, or rhododendron. They stand out well against a brick wall, too. Their wide, leafy branches soften strong vertical lines of buildings, especially at their corners, so that homes seem larger. Standing individually in the yard, they are eye-catching specimens. Planted at the bottom of a slope or below a second floor deck, their handsome blossoms make a most attractive display viewed from above. Flowering Dogwoods and azaleas are a classic combination reflecting their native association in the Eastern woodlands of the US. Dogwoods also work well in naturalized situations in unlandscaped and wooded areas on your property. The edges of a wooded lot are an ideal location. They do best planted in small groups of 2 or 3. Budded Dogwood branches will bloom indoors as early as February. However, the closer they are to their normal bloom time, the faster they will bloom prematurely indoors. Cut stems on a mild day. The more swollen the buds, the sooner they will open in the warmth of the house. To maintain a pleasing natural shape for the tree, choose branches that the tree will never miss. The longer the selected branches the more flowers there will be. Long stems are also more versatile for indoor arrangements. Change the water periodically. When you see some color in the buds, arrange the Dogwood branches in a vase with fresh water. Add some commercial floral preservative or some citrus-based carbonated soda (non-diet) to the water to prolong their freshness when the flowers open. Bring them into a bright room where they can be appreciated. These blooms should last about a week and lift winter weary spirits.